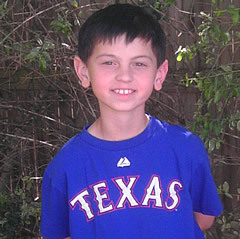 Eleven-year-old Sam is from Texas and has Neuroblastoma. He has been fighting cancer since he was four years old. Sam travels from Texas to New York to receive his treatment. He plays sports, does well in school, and sings in the school choir. Sam is a determined kid who inspires his family with his perseverance! His family remains hopeful that a cure will be found.